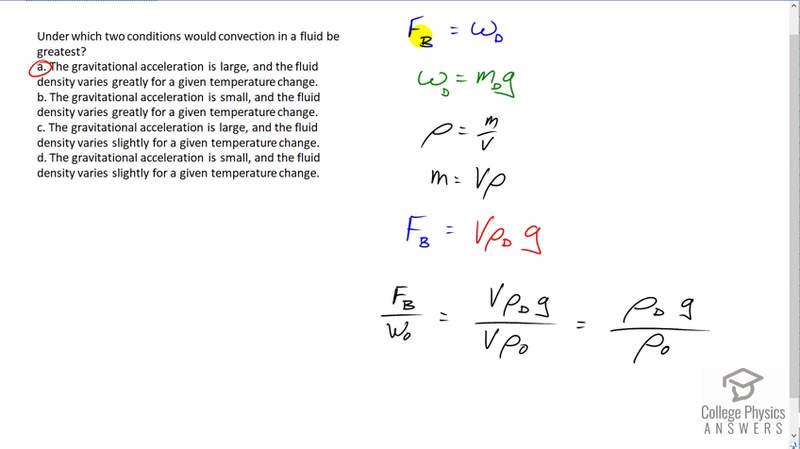 Under which two conditions would convection in a fluid be greatest? The gravitational acceleration is large, and the fluid density varies greatly for a given temperature change. The gravitational acceleration is small, and the fluid density varies greatly for a given temperature change. The gravitational acceleration is large, and the fluid density varies slightly for a given temperature change. The gravitational acceleration is small, and the fluid density varies slightly for a given temperature change. This is College Physics Answers with Shaun Dychko. So, convection is caused by a buoyant force applied on a hotter bit of the fluid which has a decreased density due to its increased temperature unless that things float upwards. So, we need to talk about how the buoyant force changes with acceleration due to gravity and density. So, the buoyant force is equal to the weight of the fluid displaced. That's Archimedes' Principle. And, we'll express this weight of fluid displaced in terms of G and density. So, the weight of the fluid displaced is the mass displaced times G. And then, mass we can express in terms of density by saying density is mass over volume. Multiplying both sides by V, getting mass, and plugging in volume times the density of the substance displaced, that's why the subscript D is there. D for displaced, times G. So, that's the buoyant force. Now, the buoyant force in of itself is not enough to tell us which way a hot fluid is going to move. We need to find the ratio of the buoyant force to the weight of the hot fluid. I wrote O for object because this line of reasoning works for, you know, pieces of wood and water as well as hot air within cold hair, or hot water in cold water. So, the ratio of the buoyant force to the weight is going to be volume times the density of the displaced fluid times G, as we have here. And then, divide by that the weight of the fluid that's doing the displacing or that's floating, which is going to be volume times the density of the object that's submerged times G. And, well we have the mass of the object is volume times density, and then we multiply by G to get the weight. And, the volumes are the same, because the volume displaced is going to be the volume of the object being submerged. The G is also cancelled. And so, the ratio is going to be the ratio of their densities. And so, that means as the over large density differences, you're going to have more convection. You can also say that things will depend on gravitational field strength because we see that the buoyant force depends on G. And so, if gravitational acceleration is large, it's going also to increase the buoyant force. It won't increase the ratio, but the ratio is not absolute terms. You can have a very small ratio and still have a large acceleration. It depends on what numbers we're dealing with. So, anyway. So, buoyant force, you can see a dependence on G here. You can also see density is related to the question. The greater the differences in density, the greater the ratio of buoyant force, the weighted. So, A is the best answer.